Echo Women’s Choir is performing a concert on Mother’s Day afternoon, with Ukrainian singers Mark Marczyk and Marichka Kudriavtseva of Lemon Bucket Orkestra. I am not conducting in this concert, but am singing with a full heart! 1) The concert is lit by candles in the 150-year old Holy Trinity Church in downtown Toronto. This is an utterly magical setting to listen to Echo Women’s Choir sing pieces by Malcolm Daglish, Tom Chapin, and others in honour of Earth Hour. 3) Our very special guest artist is Annabelle Chvostek, juno-nominated singer-songwriter and multi-instrumentalist, former member of the Wailin’ Jennies, and an incredible performer. I love her politics and I love her music. I think you will, too. 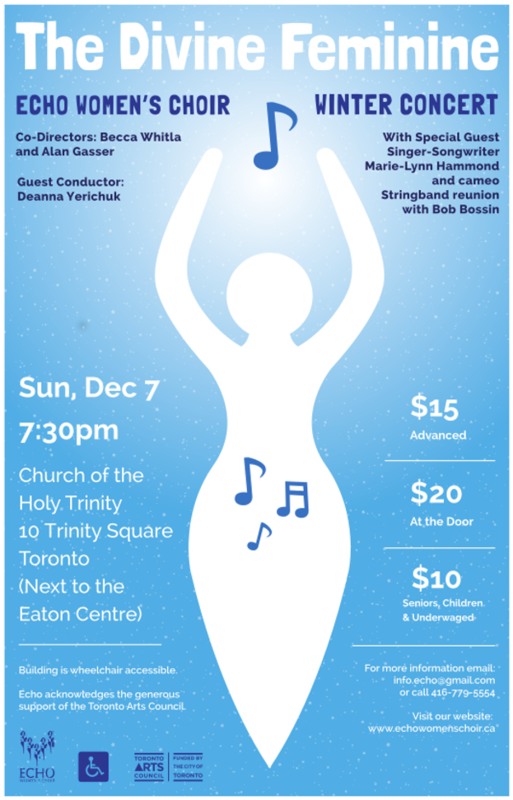 I get to work with the wonderful Echo Women’s Choir this semester, and am conducting a set at their concert on December 7 in downtown Toronto. I’m loving the repertoire this season: a couple challenging Ave Maria kinds of pieces (unusual for Echo); a ladino lullaby; some Georgian crazy-harmony pieces; a gospel piece. I think it’s going to be a fantastic concert. Doane, as well as Echo, and I’m going to conduct one of the songs and sing with them. The whole evening is hosted by Andrew Craig. that introduces the world’s oral cultural traditions to Ontario classrooms. I honestly can’t think of a better way to spend Earth Hour. You can buy tickets at the door, and details are in the poster here. And I’ve posted this before, but it’s so beautiful, that it deserves a second viewing. This is Gurpreet Chana playing his composition ‘Gratitude’ at the Earth Hour concert in 2012. I’m in a ‘choir.’ I have a hard time telling people I’m in this choir without putting quotes around the word. Because you see, it doesn’t look anything like any choir I’ve ever seen or participated in. If your definition of choir is a group of people singing together, then yes. We’re a choir. But after that, us and most other choirs depart ways. You’re probably familiar with a typical choir: people arranged in rows according to voice type, facing a conductor and singing multi-part scored music. I’ve sung in these kinds of choirs, and I’ve directed versions of these choirs, and I love these choirs. I’ve been a part of choirs that have broken some of these traditions too, which I also enjoy. But THIS ‘choir’, initiated and led by Fides Krucker (a strong influence in my singing and teaching, as you might already know), is a totally different animal. It has about 10 women in it. We meet in her living room, generally stand in something loosely resembling a circle, and begin with breathwork, sighs, yawns. We spend some time on vocal slides. We make eye contact with each other. We move around. We stand our own vocal ground while at the same time listening to each other, stealing sounds and gestures from others that we are drawn to. Then we sing some songs. Mostly pop songs. Mostly in unison. Fides focuses on what she calls ‘vocal texture’—the individual and collective timbral quality of our singing voices demanded through the emotional and vocal journey of each song. For me as a singer, there is a palpable kind of emotional intensity through this approach to collective singing, whether it be joy or anger or sorrow. And these ‘performances’ might in many ways be the most extraordinary thing about this ‘choir.’ The ‘performances’ have all taken place at Ernestine’s–a women’s shelter in Toronto. We cram ourselves into a tiny room lined with green couches and a deliciously out-of-tune piano, replete with a few broken keys. And what makes it not-quite-a-performance is that the women of the shelter are invited to join in rather than just watch. In fact, the ‘choir’ sits among the residents on those horrid green couches. We all warm up together, and learn a song together. It’s more like a rehearsal or workshop. Except half of the women haven’t sung much, there are three interpreters, and children run in and out of the room constantly. It’s remarkable, because the ‘choir’ isn’t there to perform nor is the ‘choir’ there to use music as a tool to fix or improve anyone. We are all there working together, on our own and our collective vocal journeys. If this is a choir, I want me lots more. So it’s 2013. Where did last year go? 2012 brought so much live music into my life, and I drank it all up like a thirsty man finding water in the desert. I have two young kids, so getting out of the house at all, let alone seeing tons of live music, is nothing short of manna. I went to Hillside Festival in Guelph, and to the Edmonton Folk Music Festival, in, well, Edmonton. Got to see Merill Garbus and the incredible tUnE-yArDs (watch this video for a sample of her crazy/raw/fun aesthetic), and I fulfilled a life-long dream of seeing kd lang perform—my expectations were high and she blew them away. Oh, and Leonard Cohen! He was unbelievably amazing. It’s been a big year for seeing live acts. And so much of it was so inventive, I felt really fired up listening to these exciting boundary-crossing kinds of musical works and performances. Professionally, I was also extremely lucky to conduct Echo Women’s Choir in the Spring of 2012—a fantastic group of 80 women from various backgrounds and professions, all coming together to sing some pretty wonderful and at times pretty challenging songs from many singing traditions. The honour of conducting Echo was one of the two professional highlights of my 2012. The other was the growth of my singing studio—some new students came in last year that have just been incredible to watch and work with. And students who have studied with me for longer all seem to have found newer and deeper growth in their vocal journeys this past year. I’ve learned so much from my students, and am so proud of what they’ve accomplished, and inspired by their willingness to risk and put themselves out there. So in many aspects a good year for music. But still. Watching all that music and watching the work of my students gave me lots of ideas for some musical projects moving forward. Now that I’m in the throes of my dissertation work, I hesitate. Do I have enough time to take on another project, in addition to being a student and a teacher and a mom? I’m not sure but I think I have to try. I think my first order of business is upload some clips from my 2010 cabaret ‘Undone’ with Jen Cook. I was proud of that work, and I think I’m ready to share it, or at least pieces of it, with the world. Next, deciding which musical project to start with. Stay tuned…hopefully by summer I’ll have something more to say here. I guess this is my New Year’s Resolution, though it feels like more. A commitment to singing, my own passion. But here it is: in 2013, I’m going to work towards more performance. And may I be so bold as make a request of you for 2013? Go see live stuff. See some live music. See a play. See a dance show. You don’t need to spend a lot of money on big ticket concerts and broadway-style plays. In fact, it’s in many ways better to see the band at your local pub, or see the innovative work of your local theatre companies. Nothing compares to the live experience, not even in the digital age of facebooking and tweeting and youtubing. You have to be there. OK, 2013. Bring it on. The Twentieth Anniversary Season Concert for Echo Women’s Choir happened this past Sunday. I had the pleasure and privilege of guest conducting a substantial portion of the concert. I don’t have any video or audio–yet–so you’ll have to take my word for it: these 80 women sounded wonderful. The program was pretty eclectic: some gospel, some worker/protest songs, an Arabic love song, a few pieces from the Republic of Georgia. The central piece was a composition called ‘Sun’ (conducted by my colleague Alan Gasser), with text by Eliot Rose and music by William Westcott–this full-on, massive sounding,insane piano-accompanying, hard-to-sing vocal yearning for spring. I’m not sure I’ve ever heard that much sound in Holy Trinity Church before. It was glorious. Echo is a community choir, meaning no auditions to get in, just have to wait patiently for your name to come up on the wait list–maybe about a year. If choral singing is your thing, or maybe your thing, there are numerous choirs in the GTA for every singer and for every taste. A good starting place are the Canary Pages of Wholenote magazine that come out in May. You can find the pages in stands around the GTA, or browse their online map of choral groups. I got the pleasure of writing the editorial for this year’s edition, too. But for me, Echo has been an amazing experience, and I’ve been blessed to be a part of their singing work. This is it! Echo’s Spring Concert is almost here. I’ve been having an insanely wonderful time conducting this fantastic group of 80 women. Come and listen to us sing songs from many traditions–Georgian, gospel, South Indian, folk, and a whopper of a piece called Sun composed by Bill Westcott using a stunning visceral poem written by Elliot Rose. Plus, guest artist Suba Sankaran, of Autorickshaw. We’re singing several of her songs and arrangements, from a traditional Carnatic processional to an arrangement of Bobby McFerrin’s Freedom is a Voice. It’s going to be a wonderful afternoon, hope you can join us! Usually I’m not a fan of being in the dark, but if this year is going to be anything like last year, spending $25 to sit in a candle-lit 100-yr old church listening to music and stories could possibly be the best way to spend your 2012 earth hour. The event is “Voices in the Dark”– a joint fundraiser for Echo Women’s Choir and Mariposa in the Schools, with guest artists Chris Rawlings, Dan Yashinsky, Sandra Whiting, Njacko Backo, the Miss McCarthy’s, Anne Lederman, and Echo. Hosted by Jowi Taylor. In honour of Earth Hour, the first half of the concert is performed in the dark, lit by candle light. Just to give you a teaser, here is a clip from last year’s joint funraiser. The artist is Gurpreet Chana (otherwise known as The Tabla Guy) performing his incredible, and incredibly moving, piece Gratitude. Enjoy, and hope to see you on March 31. Well, ‘tis the time of year for seasonal concerts of all kinds. Here are a few that I’m involved in, or planning to attend. Maybe I’ll see you at one of them? The concert is named after one of two pieces I arranged for them, both written by the wonderful singer-songwriter Laurel James. I’ve heard them rehearse and the evening promises to be warm and enjoyable with repertoire from regions around the world. A one-hour concert by the long-standing Toronto Jewish Folk Choir. I’m thrilled to be joining the sopranos for this concert—the group is absolutely wonderful. Plus the concert is free! Wednesday, December 7, 2011 @ 7:30 pm. If more traditional choral music is your thing, check out this concert from the Faculty of Music at University Toronto, where I’m chipping away at my Ph.D. The concert features a triple bill of the MacMillan Singers (conducted by Dr. Hilary Apfelstadt), the Women’s Chorus (conducted by Ana Alvarez) and the Men’s Chorus (conducted by David Holler). And all three choirs will form a massed choir to perform the Pinkham Christmas Cantata, along with brass from the U of T Wind Ensemble. Yep, there’s gonna be a lotta sound coming off that stage. OK, I’ve never seen these guys perform before, but who can resist a concert when their web site calls them “an older, less dysfunctional version of Glee”? Plus I’ve worked with their conductor Dan Rutzen and he’s amazing. So if you’re into 4-part barbershop a capella-style harmonies, check this one out. There are probably several dozen other performances of choral and vocal concerts happening around the city. If you’d like a more complete listing that’s not at all Deanna-promoting, Wholenote magazine has a pretty comprehensive listing of concerts in the GTA. Happy season to you! get info about voice classes! Contact Deanna for info on voice classes and private lessons.